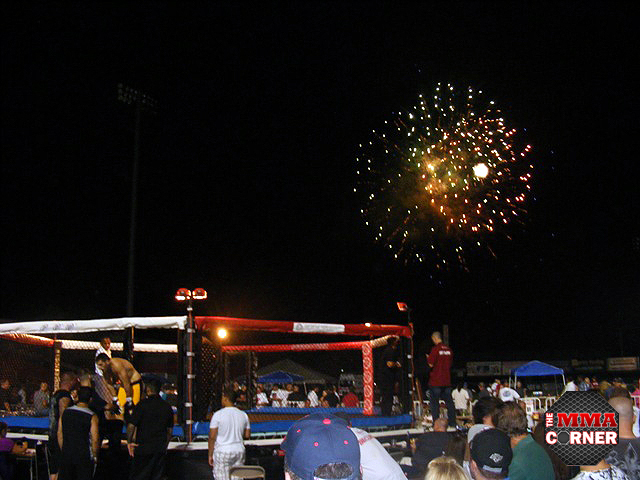 When Mixed Martial Arts is held at an outdoor venue, it is common to constantly be checking the weather forecast in hopes of clear blue skies. The weather reports had been calling for thunderstorms all week, putting the event in jeopardy of even taking place. 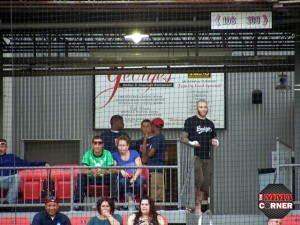 On Saturday night, the rain and lightning held off, but there was plenty of thunder behind the fists of the competitors as Cage Fighting Xtreme 21 took place at Campanelli Stadium in Brockton, Mass., the home of boxing legends Rocky Marciano and Marvin Hagler. There were a total of 15 fights on the evening, headlined by a middleweight title fight between champion Joe Lamaroux and Jay Dublin. They say you’re not a true champion until you defend your title. That was the goal of champion “Sloppy” Joe Lamaroux as he entered the cage for the main event; to successfully defend his title and walk out of the stadium as the champion. Off of the touch of the gloves, Jay Dublin went head hunting, throwing and landing bombs. Lamaroux was able to weather the storm, eventually landing some strikes of his own and working a takedown after being pressed up against the cage. The fan favorite quickly moved to mount and threw some strong hammerfists and elbows that both his corner and the fans were calling for. The rest of the fight looked very similar to the first round, where Dublin would come out looking for the home run punch, but ultimately was unable to survive being taken down. While on the bottom, he did a good job protecting himself from a bulk of punishment from Lamaroux’s ground-and-pound; however, he couldn’t get off of his back, and that was the story of the fight. To the fans applause, “Sloppy” successfully defended his title and exited the cage with the belt around his waist. With the victory, the South Shore Sport Fighting product improved his record to 6-1 as he took the unanimous decision victory. Local fight fans were excited to see a fighter from “The City of Champions” represented on the action as local fighter Steve Dunn made his return to fighting after a year-and-a-half hiatus. “The Sandman” came into the cage with the pride of the city on his shoulders, but ultimately fell short to Joe Powers by unanimous decision. Early in the first round, Powers landed a takedown. Unable to hold Dunn down long, the fight returned to the feet where the two traded jabs and tried to establish the distance. From there, “The Sandman” shot for several takedowns, only to continuously come up short because the shot was from too far away. Eventually, he was able to shoot and grab a leg which led to the takedown. From there, Dunn ground-and-pounded out the round from half guard. As the fight moved to the second round, it was clear that Dunn was starting to look tired as his pace clearly slowed down. He continued to shoot for takedowns from a distance, and kept coming up short as the Team Dexter fighter saw them coming from a mile away. “The Sandman” was able to shoot and grab a single leg near the end of the round, but Powers was able to sprawl out, keep the top position, and work body shots until the bell. The way the second round ended is exactly how the third round went as a gassed Dunn continued to try for the takedown, only for it to be stuffed and sprawled with Powers on top. The combination of “The Sandman” being tired and the accumulation of body shots from Powers from that position were enough for him to take the round. When it was all said and done, Powers got the nod from the judges as he took the unanimous decision victory from his ability to defend the takedown in the second and third round. Steve Skrzat was the second fighter to enter the cage and he took a shot at his opponent, Jessie McElligot, with his choice of music as he walked out to “Jessie’s Girl” by Rick Springfield. The Rukus MMA fighter may have gotten the first laugh, but it was his opponent who got the last laugh as two of the three judges sitting cageside saw the fight in favor of McElligot. In the first, Skrzat landed a quick slam on his opponent and from the top position worked a strategic ground-and-pound. 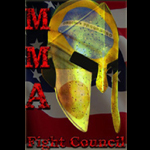 Staying busy from the bottom, the Connors MMA fighter was able to turn the table and sweep the position to get himself on top. The fight eventually got back to the feet and Skrzat got a takedown right at the bell to end the round. The second frame opened with a reversal of fortunes, as there was another slam, but with Skrzat on the receiving end of things this time. McElligot was able to stay on top for a bit, but the fight returned back to the feet. After an awkward side slam by Skrzat, the two competed for leg locks to round out the second. The Rukus MMA Fighter landed a quick takedown to start the third, and when the fight immediately returned to the feet, McElligot was able to gain a standing back control. He rammed his opponent’s chest into the cage from the position, sprung off of it, and used the momentum to pull Skrzat down from behind. McElligot quickly transitioned into a crucifix where he punished his opponent. Realizing he wasn’t ending the fight from there, he moved to mount and punched out the round from there. When the judges rendered their decision, it was read that McElligot had done enough as he took the split decision victory by a score of 30-27, 29-28, 28-29. John Downey came out and landed an immediate takedown at the start of his fight against Joe Cronin. “The Machine Gun” was looking good as he transitioned from half guard to mount, throwing strikes along the way. Cronin was able to manage his way out of it and return the fight to the feet where he landed a takedown of his own. In control of the situation, “Nightmare” ended up on his opponent’s back, where the inevitable fight-winning rear-naked choke was applied. The victory improves Cronin’s perfect record to 2-0 with two stoppages. 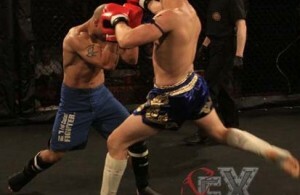 At CFX 19, Gerry “The Punching Bag” Spiegel defeated Mike Zichelle by third-round stoppage. 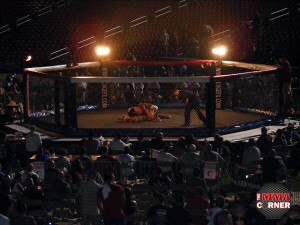 The fight was good enough to warrant a rematch, which took place at this event. “Ruthless” came out and secured a Muay Thai clinch early in the round and landed several strong knees to both the body and the chin of his opponent. Somehow, Spiegel was able to battle out of it with his senses intact and throw a spinning backfist followed by a storm of punches, only for Zichelle to again take the fight against the cage and land strikes to close out the round. The two came out for the second round and “Ruthless” again pressed forward. 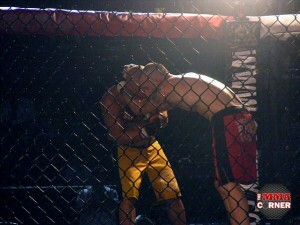 Even with his back up against the cage, Spiegel was able to absorb more strikes and turn the position into a takedown. From there, he transitioned to mount and eventually back mount, where he sunk in a successful rear-naked choke. As his nickname implies, “The Punching Bag” absorbed a ton of punishment, but it wasn’t enough to carry Zichelle to victory as Spiegel again defeated “Ruthless”. 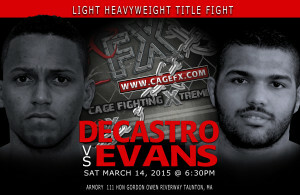 Both Jared Sarno and Gabe Sachetti were making their professional debut in their flyweight contest. As flyweights tend to do, a nice exchange and flurry came off of the opening bell with both fighters landing sound punches. 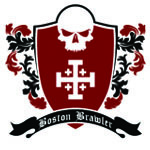 Off of the strikes, Sachetti took down “The Badger” but in doing so, left himself wide open for an armbar. The submission hold was enough to make the Pin2Win fighter tap out, and end the fight in just 36 seconds. Fresh off of his first career victory just a week prior, Hector Sanchez could not handle the assault brought on by Shawn Baker. 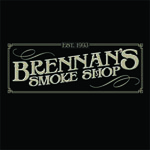 “The Neck Breaker” got an early takedown and was able to transition from one position to another, ending up in mount. The ground-and-pound was just too much for “Spartan” to handle as the referee intervened, awarding a TKO victory to Baker. After controlling the first two rounds, Rob Font was able to secure a guillotine choke after a failed takedown attempt by Lionel Young in their fight. The choke was good enough to secure the victory for the Team Sityodtong fighter, and improve his record to 3-1. Twenty seconds was all that Eric Bedard needed to take down Jason Dolloff. The heavyweights clashed right off of the opening bell and “The Angry Man” paid the price for it as Bedard landed a strike that put Dolloff on his rear. 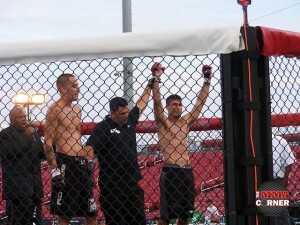 “Lucky Strikes” followed through on it and earned the fast TKO victory. For the vacant amateur welterweight title, David Worman made short work of Scott Brown after landing a slick combination. Brown was knocked to the ground and swarmed up by Worman, who captured the championship. Brian Allard won his first amateur fight by disposing of Joe Flynn in just over a minute. The fight almost ended just a couple of seconds after Allard achieved an early knockdown, but after securing top position he applied a straight ankle lock, which won Allard the fight.